Florida International University (FIU) is seeking a business partner to develop and commercialize Compositions and Methods for the Chloroperoxidase-Catalyzed Degradation of Pharmaceutical Pollutants in wastewater or other water sources. Pharmaceutical compounds that enter aquatic environments mainly come from human and veterinary medicines, such as antibiotics, antidepressants, blood thinners, hormones, and painkillers. There have been certain efforts to prevent improper disposal of pharmaceuticals, however, they do not effectively capture all drugs that might be disposed of in water systems. Several types of wastewater treatment currently exist, such as activated sludge, biological filtration, UV, ozonation, microfiltration, and ultrasound. However, these methods can be costly, insufficient to eliminate all persistent pharmaceutical residues, require further treatment before disposal due to the production of secondary byproducts, or are inconsistent because of the complexity of pharmaceutical pollutants. Given the increase in pharmaceutical and personal care product use, it is unclear whether these existing efforts and methods will be sufficient to combat pharmaceutical water pollution. FIU inventors have developed efficient, economical, and environmentally friendly compositions and methods for degrading pharmaceutical pollutants from water sources. 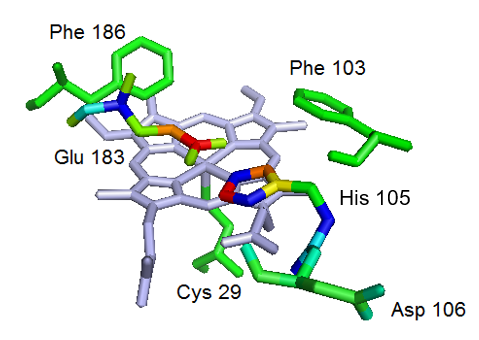 The compositions include Chloroperoxidase (CPO), a heme-containing glycoprotein secreted by the fungus Caldariomyces fumago. CPO catalyzes two major types of oxidation: one-electron oxidations, and two-electron oxidations, which facilitates the use of CPO in the treatment of environmental pollution.